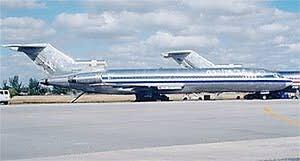 WASHINGTON (CNN) -- A senior U.S. official confirms that the government of Angola has reported a missing Boeing 727 aircraft. The plane apparently departed from Angola several days ago on a flight to Burkina Faso, in northwestern Africa, but it never made it to its destination, and its whereabouts are unknown, this official said. The official said there is "no evidence or information to suggest this is terrorist-related," and suggested "it is most likely criminal." According to this official, the plane was leased, and the people involved were behind in their payments. U.S. law enforcement and the intelligence community are working with the Angolan government to help determine what happened to the plane. When asked if there had been any intelligence from the region suggesting any terrorist activity related to a plane, the official said, "Nothing I'm aware of." U.S. officials have recently expressed concern that al Qaeda could use aircraft to carry out a terrorist attack against U.S. interests overseas. A Boeing 727 plane has gone missing on a flight in Africa and the Angolan government says it has no idea what happened to the aircraft. A US official has confirmed the plane's disappearance after it left Angola on a flight to Burkina Faso in north west Africa, but failed to arrive at its destination, according to a CNN report. The official told the news organization that there was "no evidence or information to suggest this is terrorist-related," and suggested "it is most likely criminal." According to the report, the people involved with leased plane were behind with their payments. US intelligence agencies are working with the Angolan government to discover what happened to the aircraft. It is not stated how many people were on board the vanished flight. Angolan government recommended on Friday the "Urgent Conclusion" of the inquiry on the illegal taking off, on Sunday May 25, of an airplane from the "4 de Fevereiro" international airport. The government also recommended the setting up of a multisectorial commission to study, evaluate and propose the adoption of measures aimed at reinforcing security in the airports of the country. The Angolan minister for transports, AndrÈ LuÌs Brand"o, assured that the inquiry is being done and that in his department "The results of inquiries are always published", adding that it was a very unusual case AndrÈ LuÌs Brand"o stressed that this situation will call for urgent and efficient measures to be taken to keep order and security in the "4 de Fevereiro" International Airport. The airplane, which had a USA number plate (N844AA), was in the country working for a company called "Air Angola"
Authorities in Africa and the United States are looking for a Boeing 727 jet missing from Angola since late last month under suspicious circumstances. The Boeing 727 has been missing since it took off under mysterious circumstances from Luanda airport in the southwest African country of Angola more than two weeks ago. U.S. government officials tell VOA it was last heard of requesting landing permission in the Seychelles off the coast of East Africa but never arrived there. The officials, speaking on condition of anonymity, say the aircraft's disappearance looks like a criminal act. But with memories still fresh of the bloody September 11 terrorist plane hijackings in the United States almost two years ago, the officials say they have to remain open to the possibility that terrorism may be involved in the case of the vanishing 727. Authorities in Angola say the plane took off illegally on Sunday, May 25. The country's minister of transportation later indicated the aircraft's disappearance would lead to stepped up security at Luanda airport. The plane was brought to Angola by a firm called Air Angola. According to VOA's Portuguese service, that firm is owned by a group of current and former high-ranking military officials. However the Boeing 727 had been parked idle at the airport for more than a year for non-payment of some $4 million in fees to Angola's airport authority. Some U.S. officials say they suspect the plane may have been flown off to avoid repossession. Others tell VOA they believe it may have been crashed for insurance purposes. According to the U.S. Federal Aviation Administration, the plane was built in 1975. Although it was originally operated by American Airlines, according to FAA records, its latest registered owner was an aircraft leasing firm based in Miami, Florida. Efforts to contact the firm were unsuccessful. The telephone number for the company has been disconnected. An FAA spokesman had no new information on the plane or the firm. He told VOA firms are legally obliged to inform the agency of address changes and any transfers in aircraft ownership. But the spokesman conceded that does not always happen and he could not rule out the possibility the plane may have been sold to foreign owners. Curiously, despite the FAA records, other U.S. government officials said the plane belongs to an American who lives in South Africa who leased the aircraft to others. These officials provided no additional details. Note from Stan -- Just to let you know some interesting things are happening. Data on and pictures of this Boeing 727 is disappearing. Pictures of the aircraft from 1980 and 2001 taken in Miami have been removed from Jet.Photos.net replaced with blank place holders. The N number is still there the picture is not. Revising historical data to forestall any possible contradictory evidence later? Sadly I did not take them when I started checking so I have only my imperfect memory to detect changes if any are made.